Since we had to move our fence over recently, it seemed like a good time to do something different with this spot on the back side of our chicken shed. 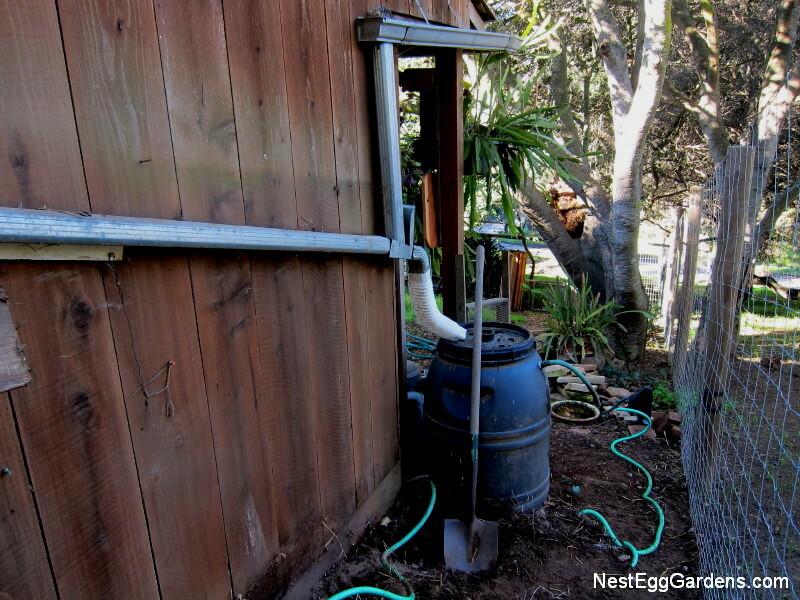 So began the chicken coop upgrade project. 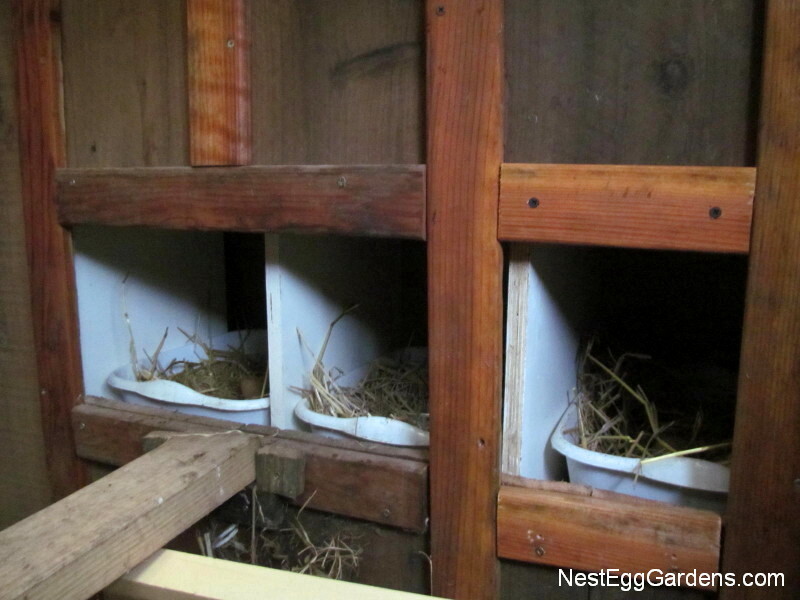 Plans began for a small attached coop when I came up with the brilliant idea of cutting through the back wall and use the existing shelves for nest boxes. We cut a hole and put up wood strips to cover the cracks in the old shed wall, and added a section of fence on the other side. The ground was leveled and covered with wire, with block walls on both sides. Salvaged wood and fiberglass was used for the next steps. A couple of 2 x 4s with smoothed edges went up for roosts. The floor was covered with straw and we added a ‘dust bath’ tub of wood ash and diatomaceous earth. 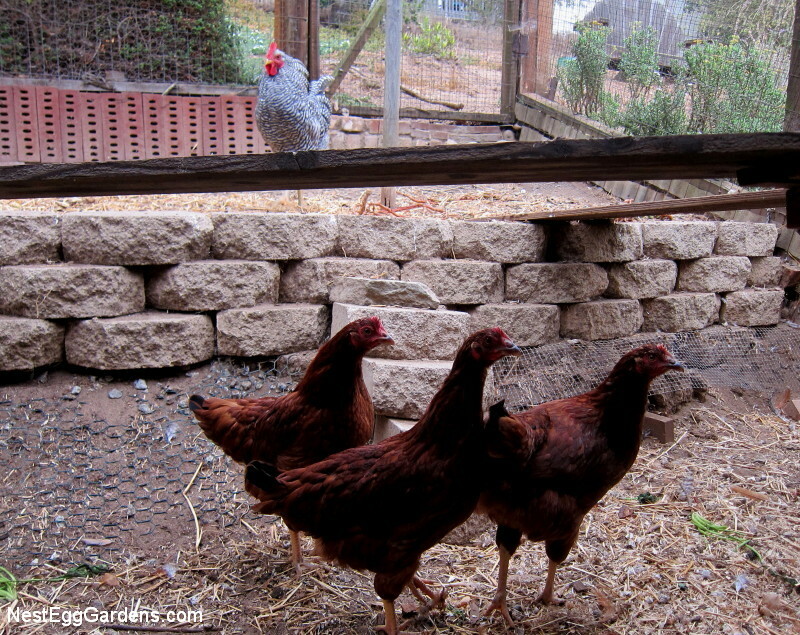 Hens naturally take dust baths in dry dirt to keep away pests like mites. 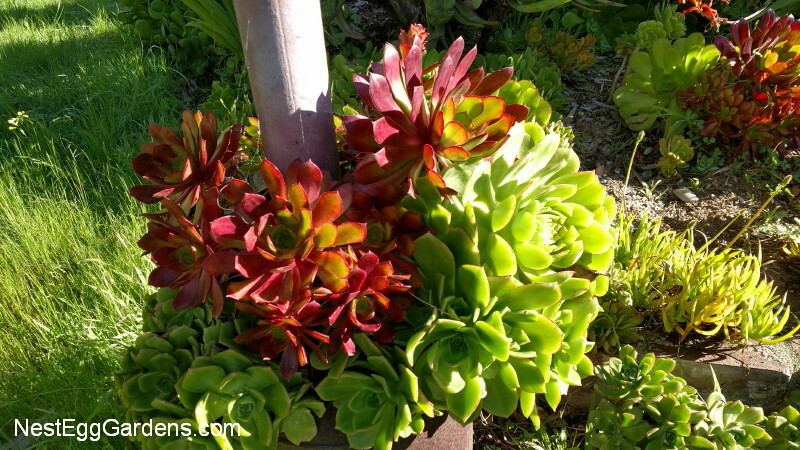 This tub will stay dry in here during the wet winter. 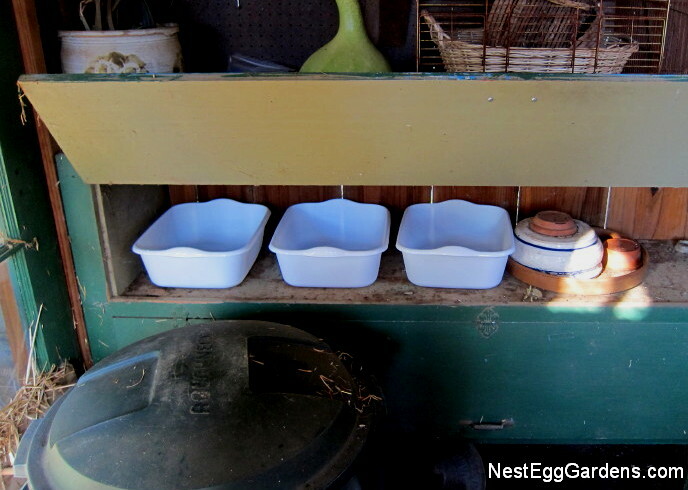 The shelf worked out beautifully for next boxes, where eggs can be gathered from inside. 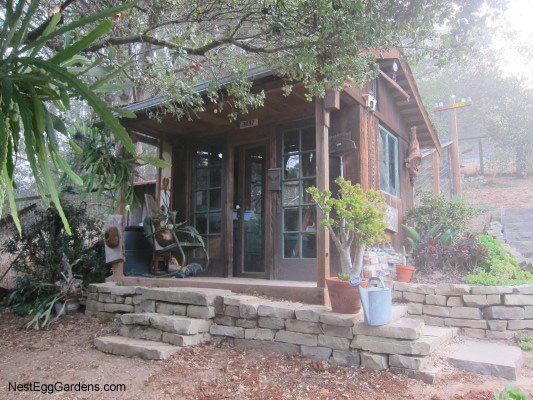 The large door on the downhill side allows for easy access. 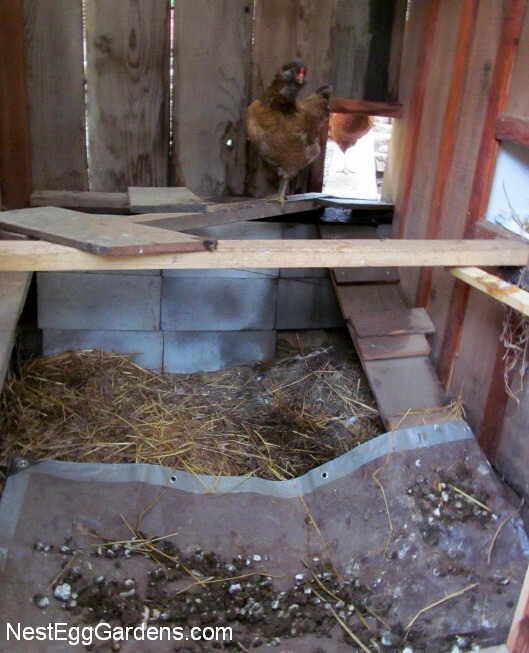 The hens are hesitant to use the coop as it’s new and different, but we’re optimistic that they will love it. 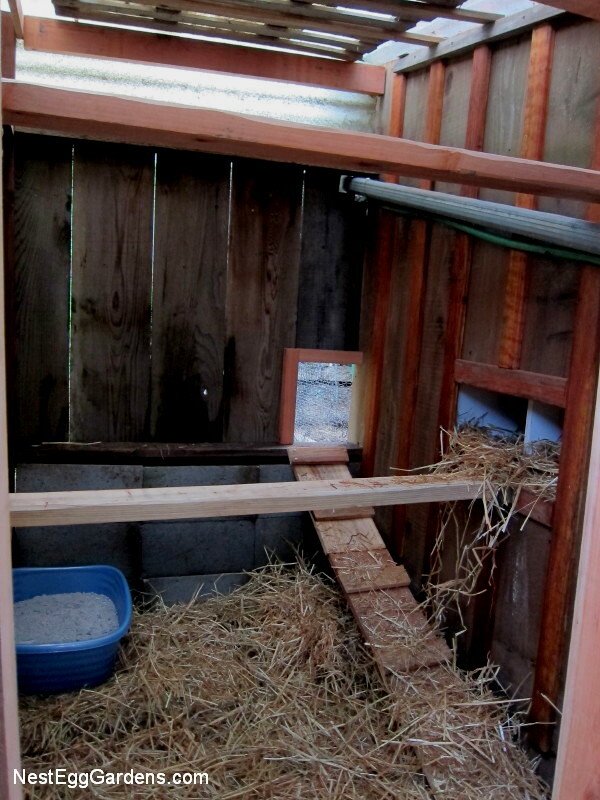 Then we can more easily introduce new chicks in the future, using our old community nest box as a brooder. 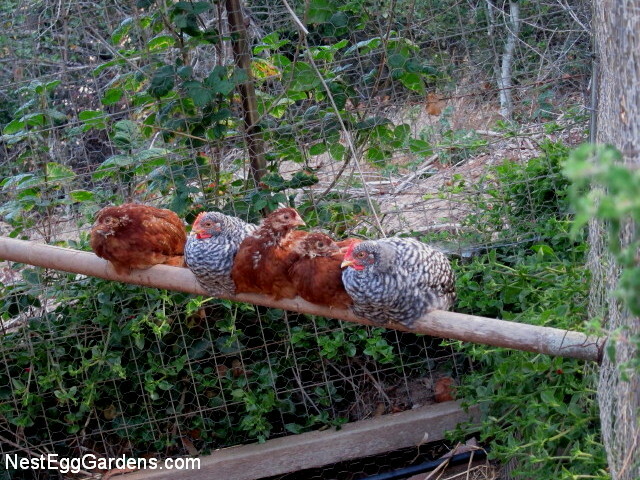 We’ll just divide the chicken yard with wire until the chicks are old enough to mix with the older hens. 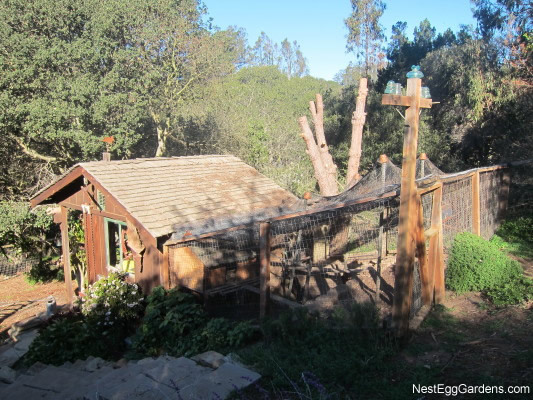 This entry was posted in Chicken Shed, Fauna, Hens, Projects on January 21, 2016 by Shelly. 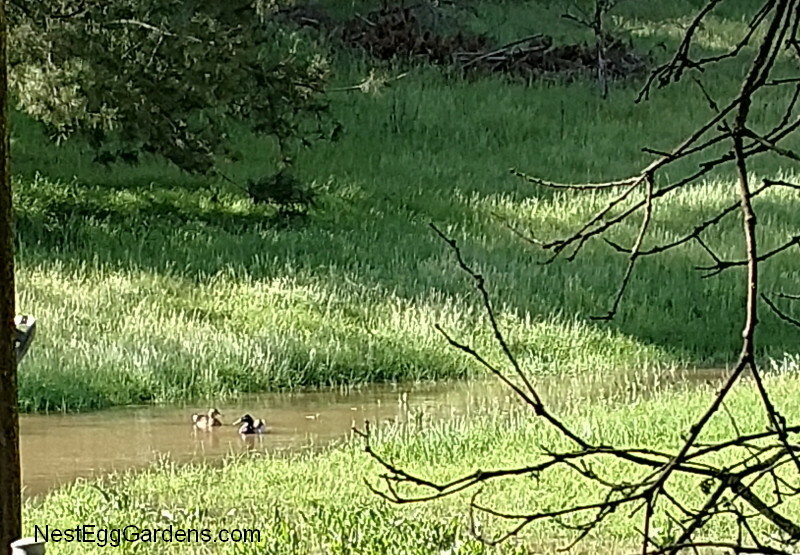 A few weeks ago, one of our two black & white Barred Rock chickens started trying to crow in the morning. Then the other one joined in! 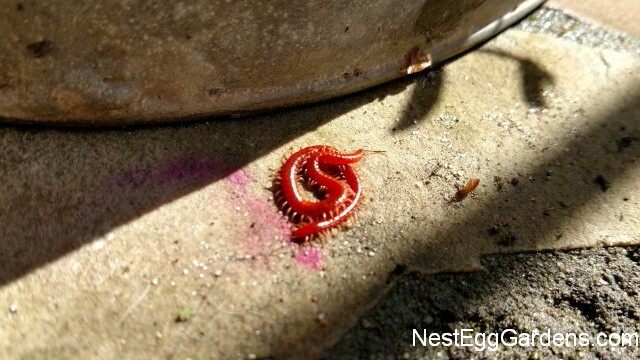 Our neighbor verified that one was indeed male, and was growing spurs on his legs. There’s a chance this could happen when buying sexed chicks from the feed store, but it’s our first time in 20+ chicks over the years. 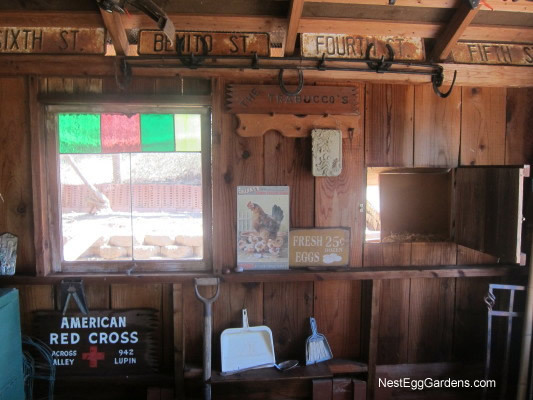 Our chicken shed is close to our bedroom, so we don’t want a rooster, and found him a good home. 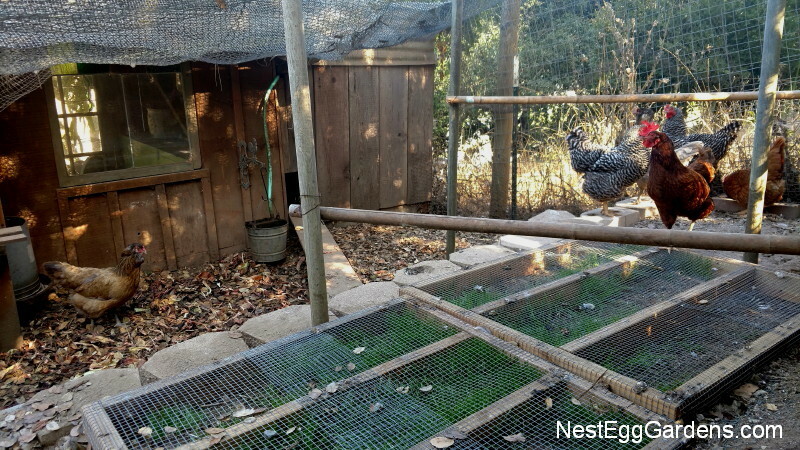 Meanwhile, the verified female chicken continues to crow every morning (see video). Hopefully when they start laying later this month, she will figure out that she’s not a rooster after all. 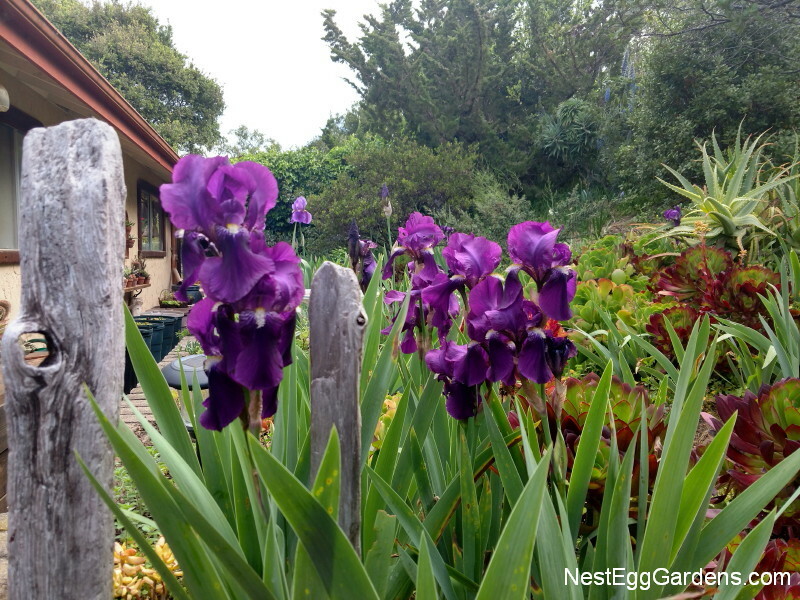 Update 10/01/15: So much for verified female… the rooster was a late bloomer and was finally getting spurs on his legs. The crowing got to be too much and too loud. He went to a good home where he can be as loud as he wants. 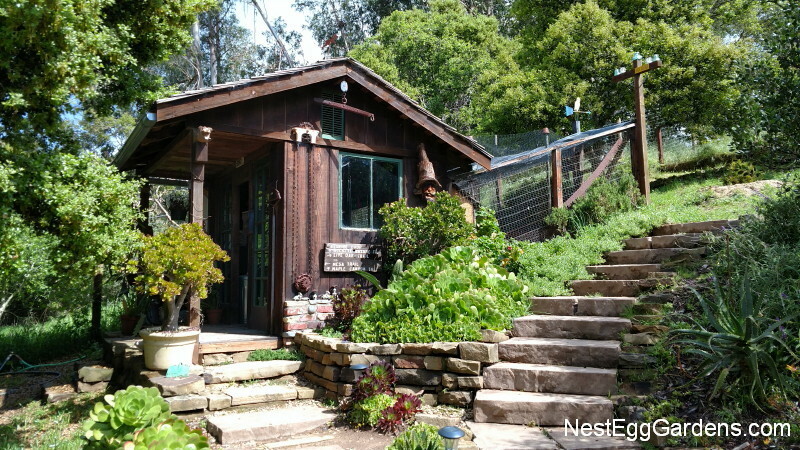 This entry was posted in Birds, Chicken Shed, Fauna, Hens on September 14, 2015 by Shelly. The chicks are about a month old now, with just a little fuzz left, showing through their new feathers. 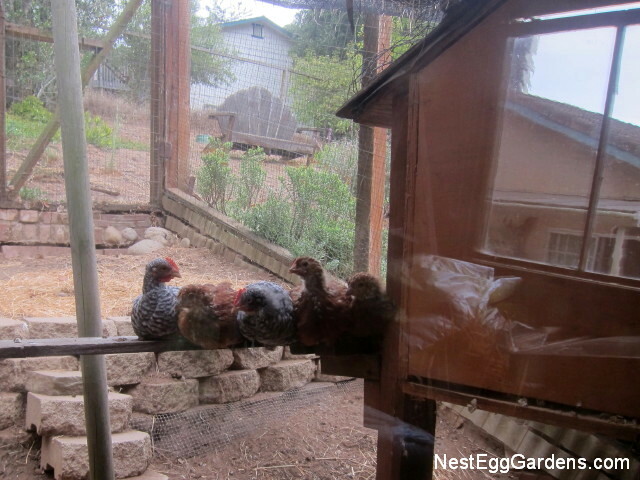 They stick together most of the time and all five made it up onto the ‘big hen’ perch in the corner of their yard. 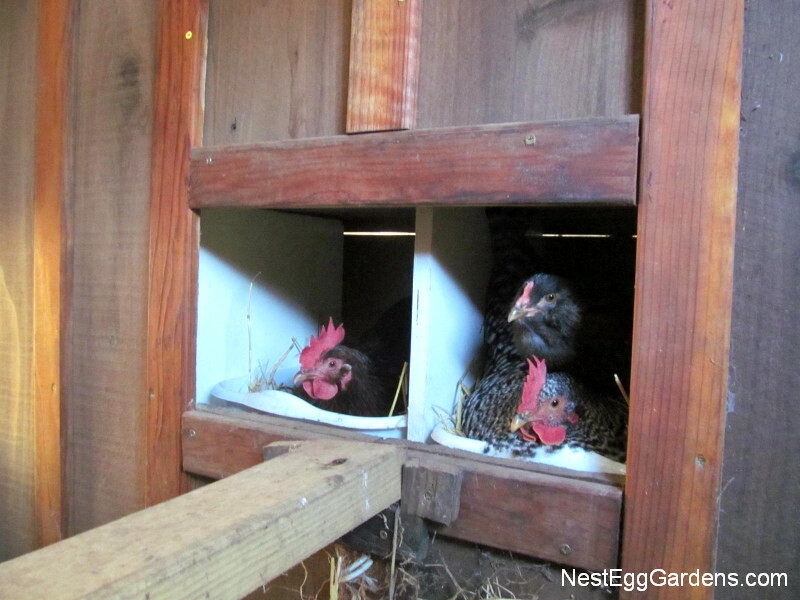 They are getting the hang of putting themselves to bed at night, in the nest box where they were brooded. 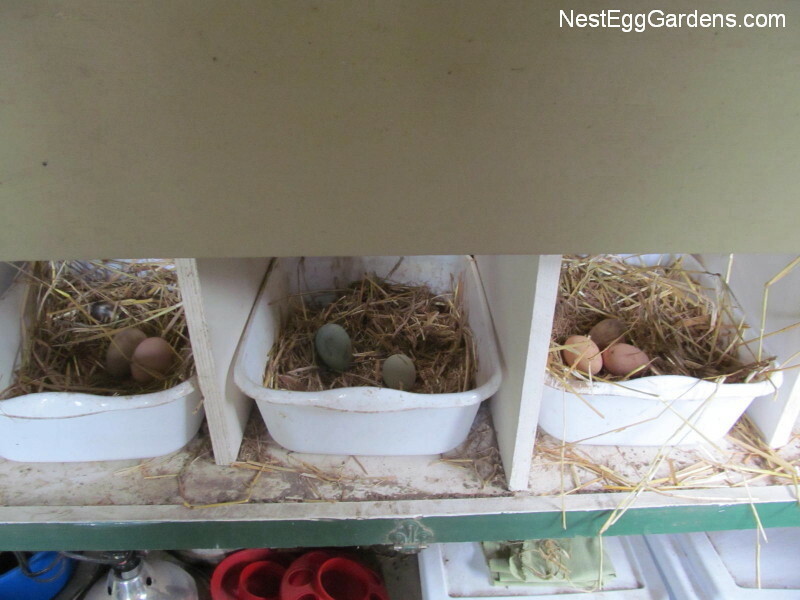 The shot below was taken through the chicken shed window and shows an interesting reflection… looks like the nest box has a window too! 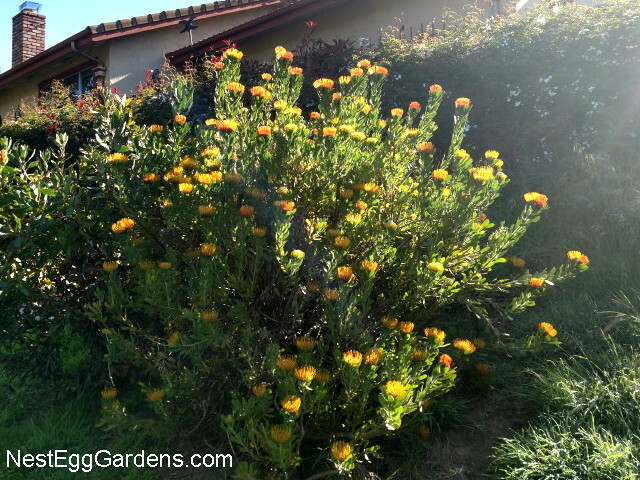 This entry was posted in Birds, Chicken Shed, Fauna, Hens on July 13, 2015 by Shelly. A couple of weeks ago, our two remaining hens went up for adoption. 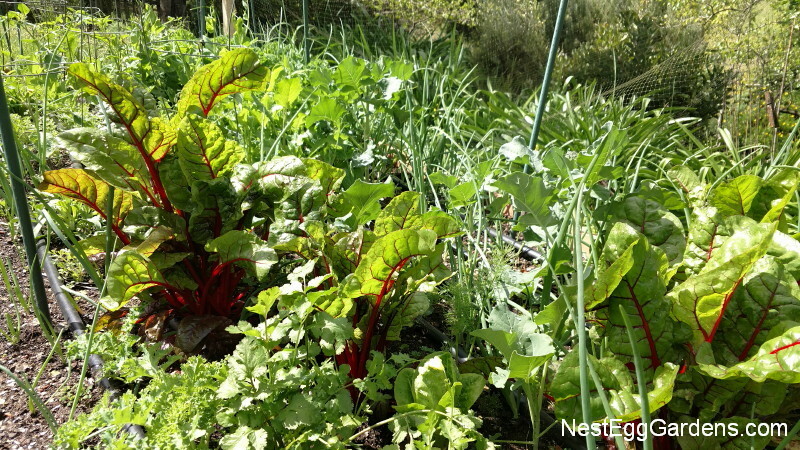 Our neighbor has several older chickens that are living out their life, being spoiled next door. It’s time to start fresh with some new chicks. This is the the fourth set of baby chicks here and this picture shows the latest Nest Egg Gardens brood on their first day. 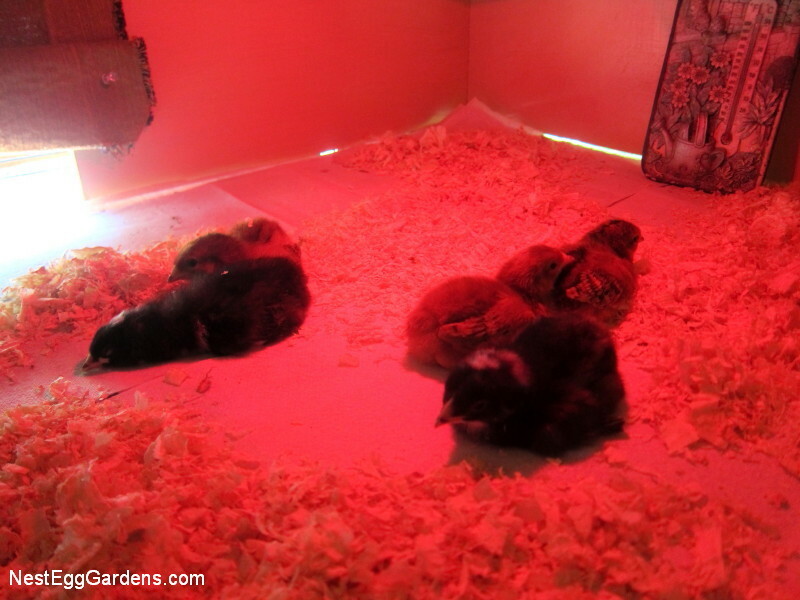 Three Rhode Island Reds, and two Barred Rocks. 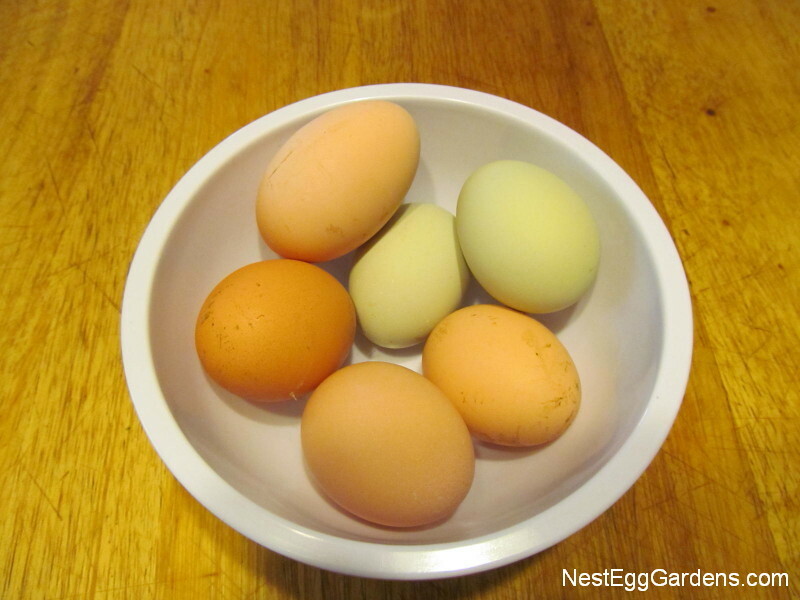 In 8 or 9 months, they will start laying brown eggs (the dark shells blend in better when composted). Once you eat eggs that fresh, store bought eggs just don’t compare. 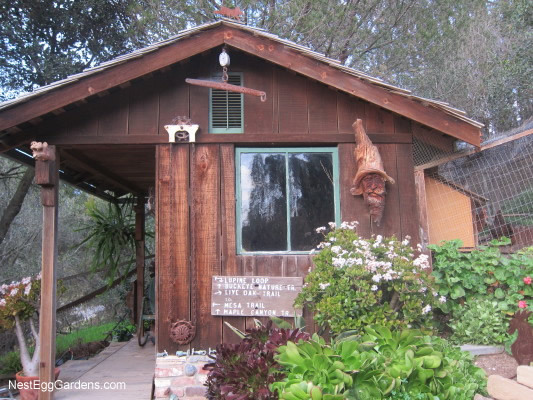 This entry was posted in Birds, Chicken Shed, Fauna, Hens on June 16, 2015 by Shelly. 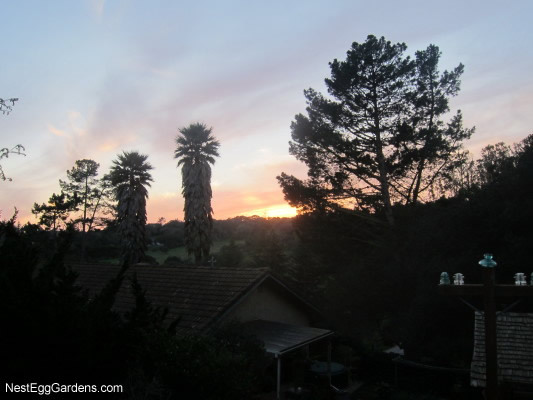 The new neighbors cut down the bishop pine tree that was growing on the fence line, over the chicken shed. 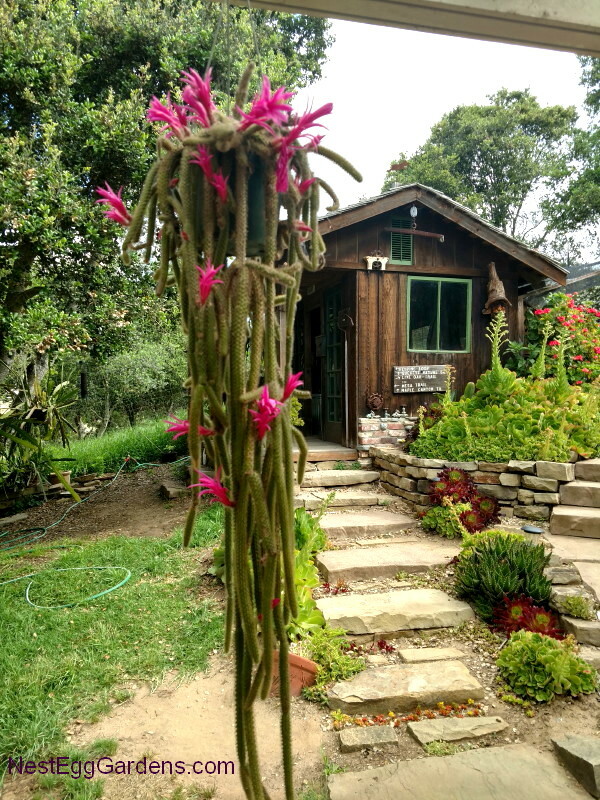 The tree was a shrub 20 years ago, but grew tall fast and has been dumping pine needles on the netting over the chicken yard and in the shed gutters for years. 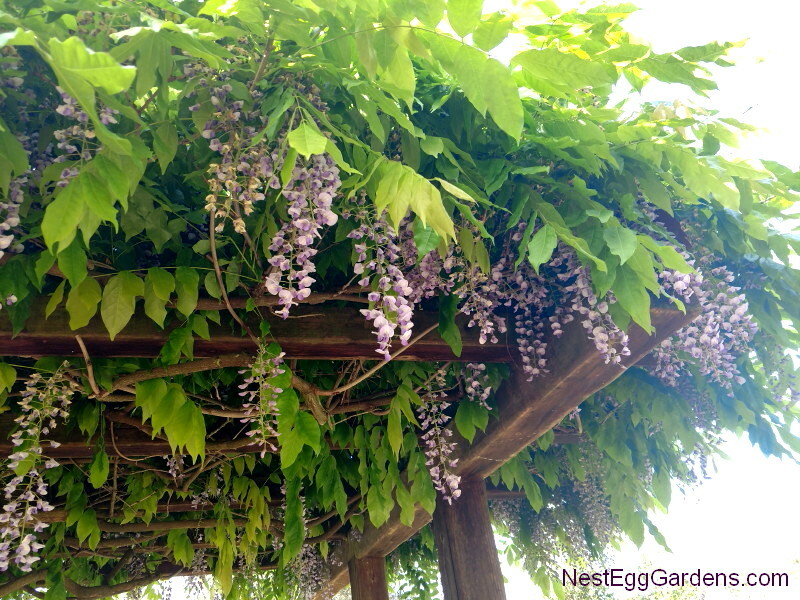 The hens just might miss it this summer when there’s no shade. Wouldn’t be the first time we put up a cover or umbrella for shade. 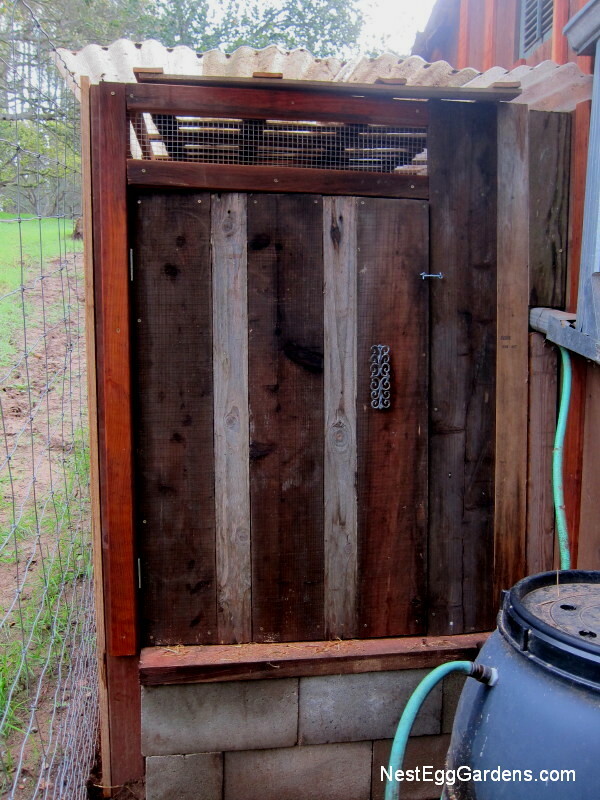 This entry was posted in Birds, Chicken Shed, Fauna, Grounds and tagged hens on February 4, 2015 by Shelly. 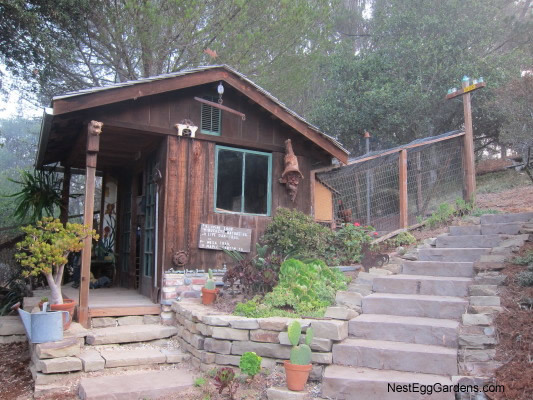 The first of the Nest Egg Gardens outbuildings, built back in 1998, the chicken shed has been a cozy home to the resident hens… usually 3 to 5 of them are on site, supplying us with fresh eggs. 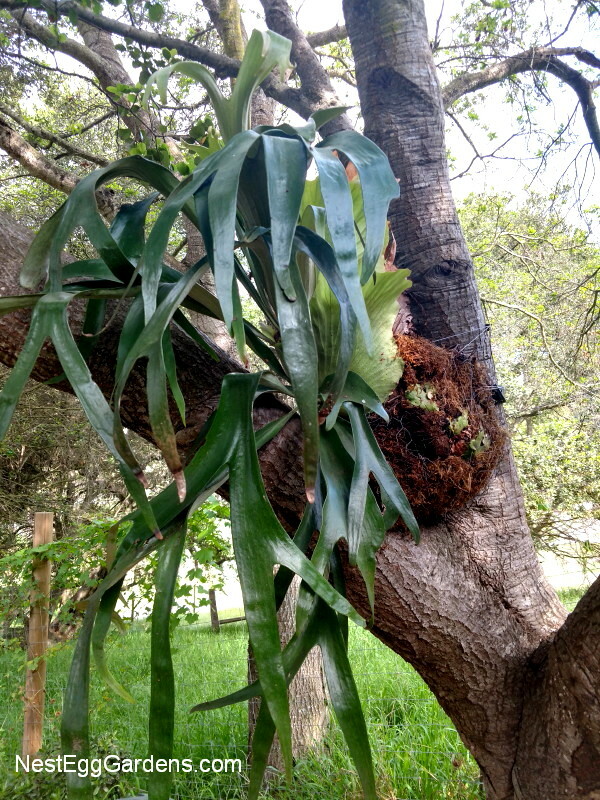 But it has become a favorite hangout for mice and an occasional rat. It needed the good summer cleaning it got recently, and now smells April fresh (due to the several dryer sheets tucked in the corners… rumored to deter rodents). 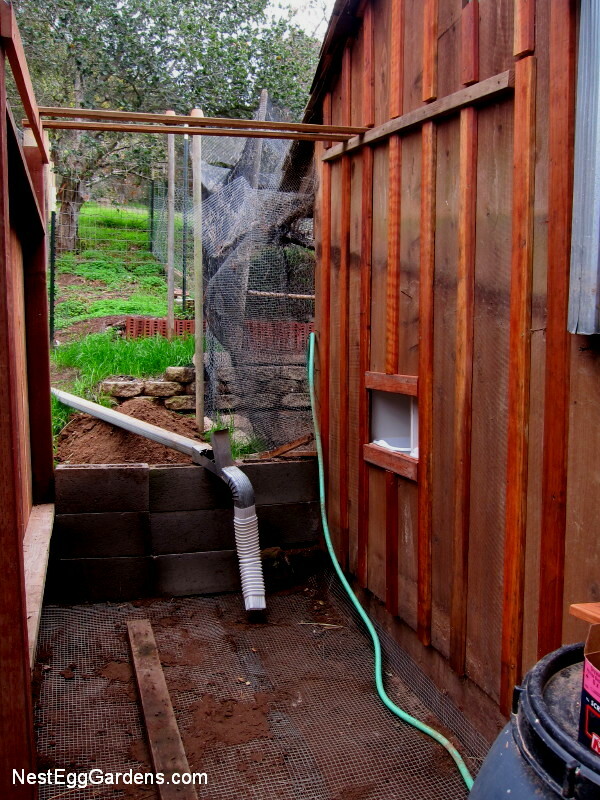 The window on the left opens at the bottom for feeding, checking water, etc. 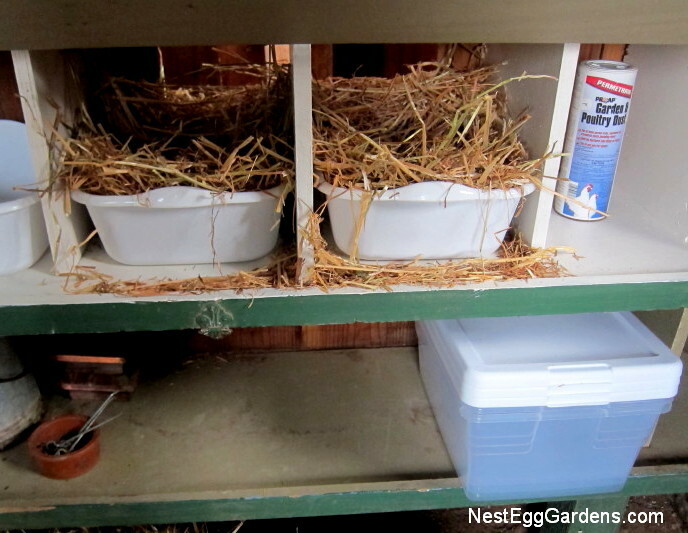 The door on the right opens up to the nesting box for easy collection of eggs. A great design that has really worked well. 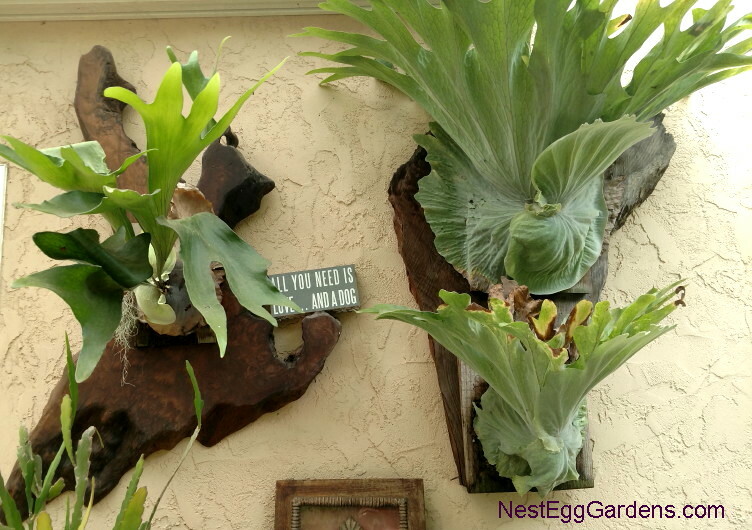 Salvaged doors and windows let in the light and it’s a good spot to protect plants from the winter frost. The stonework is fairly new… replacing the old worn out steps. 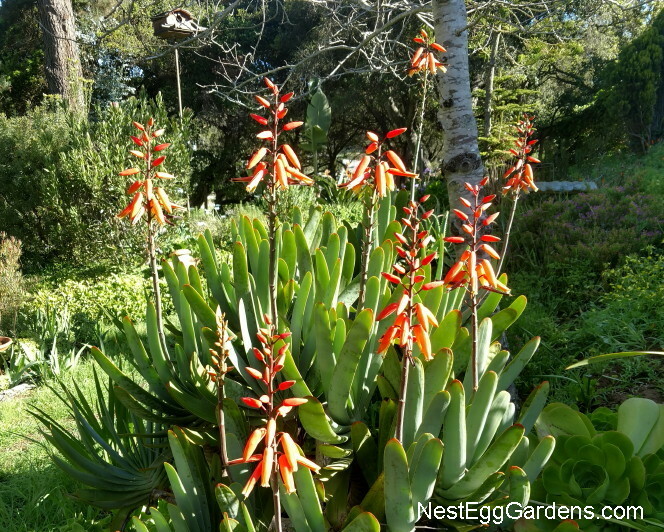 This entry was posted in Chicken Shed, Fauna, Grounds on September 23, 2014 by Shelly.